I like graduation ceremonies. Don’t get me wrong—hearing the names of a couple hundred students read in order of academic programme isn’t my idea of a wild party, but I’m glad such things exist. There’s a couple things that I like about graduations. Convocation is the ultimate example of backward compatibility. There’s something positively medieval about them. As the Principal said, the tradition of graduation ceremonies at McGill predates Canadian Confederation. If a person from even ten centuries ago was magically transported to Place-des-Arts on the morning of November 23rd, 2011, that person would probably be able to recognise what is going on, just by seeing all these acamedics in their robes and the giving of certificates. When I got the actual paper with my degree printed on it, I discovered that it was all written in Latin. According to the paper, I have a “Magistrum Artium” now. I’m going to take a picture of my degree and get my little sister (whose Latin is much better than mine) to read it at Christmas break. 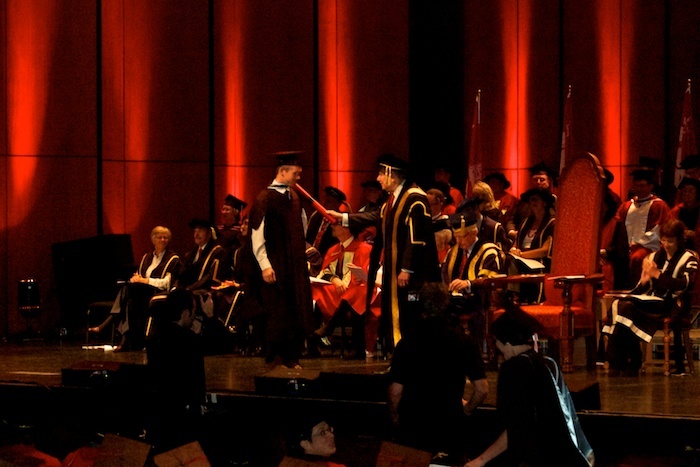 At McGill by tradition, undergrads are tapped on the head by an academic cap as they graduate. Grad students used to have their hands shaken by the Chancellor, however in the wake of the Swine Flu scare, hand-shaking fell out of fashion. (Not based on any evidence, mind you—Swine Flu is not transmitted by hand-to-hand contact.) Hence, the Chancellor hits graduate students with a tube as they pass him on the stage. That was the weirdest thing. It was like a knighting (“I dub thee “Magistrum Artium”) except it would have been a whole lot awesomer if they had tapped me on the shoulder with the sword of Gryffindor or something. Actually, I’d settle for the sword of James McGill. What’s also fun (but expensive) is the academic regalia. This time, they let me keep the hat, at least! I can wear it whenever I want to look smart and make people pay attention to my ideas. 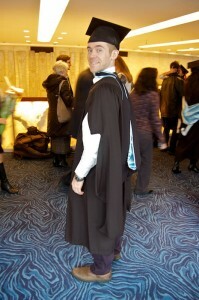 Every programme/faculty/level of achievement has a different robe/hood/hat that they wear to graduate. For a MA at McGill, you get a black robe with funny sleeves that you can’t actually put your arms through, a mortar board and a baby blue hood that goes around the neck. In the attached photo, I’m trying to show what the hood looks like a bit. That’s the interesting part. Not only do the students all wear different things, but because each professor wears the academic regalia of the school where she earned her PhD (not the school she works at), many professors will have different robes/hoods/hats. Some are boring, some are very eye-catching. 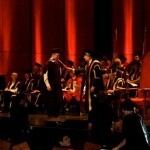 The profs who did their PhD at McGill all have funny black McGill hats. I looked at the prices of the fancy “McGill” frames that were for sale just outside the theatre and asked them how much they cost. They said they were $200 apiece. When I stopped laughing, I realised that they were serious and moved on.